Booth divider which is decorative and functional. The perfect booth divider is here! Facet, our room divider, is a beautifully designed piece of furniture. With Facet form and function goes hand in hand. When using Facet as a booth divider, you have a stunning decorative screen to look at, while it performs the function of separating different booths from each other. Personalize the pattern of your hanging space divider. The mesmerizing pattern of the screen is created by several diamond-shaped facets. These facets can be turned to different angles to create a more open booth divider if that should be your wish. By turning the facets you also change the pattern to create something that fits your personal style. With regards to installing your booth divider, we will send you an easy to follow instruction manual. Facet consists of a sturdy construction, made from lightweight material which makes it very easy to handle. The separate facets are made of a fire retardant material which is also UV-resistant to keep the chosen color as vibrant as when it was brand new. The booth divider seen in the above photo is one of our hanging room dividers. Another option would be to order our freestanding divider which is available in a wide range of 36 dimensions. That is part of the beauty of Facet, it is so versatile and the possibilities with it are endless. You can have it hanging from the ceiling or in a frame. The size can be determined by you to fit perfectly in your booth. The colors can either be chosen from our selection of six colors or you can contact us if you would like a specific RAL color. You can also choose the finish of the attachment pieces. And after you received your custom-made booth divider, you can adjust the angle of the separate facets to give it the final personal touch. An Artistic Piece of Art! It was a great online purchase experience for me, as Bas was so patient in responding to all my questions before I placed my order. As I was renovating my house, I had to delay my purchase of the divider facet for about 5 months. I was pleasantly surprised that Bas remembered my enquiries and wrote me a follow-up email to inform me of stock availability. My husband installed it and both of us are totally enchanted by it. As much as it is a divider facet, it is also a great art piece to be admired! Thank you Bas for such a simple yet amazing and impactful design! Return to the basics, focusing on silhouettes and patterns. The room divider facet consists of linked elements in shape of diamonds, which can be individually opened or closed. In the 20th century, futurist Richard Fuller challenged the foundations of architectural thought. His legacy continues to snowball. Fuller's influence on a new generation of designers is seen in 'lightfacet'. 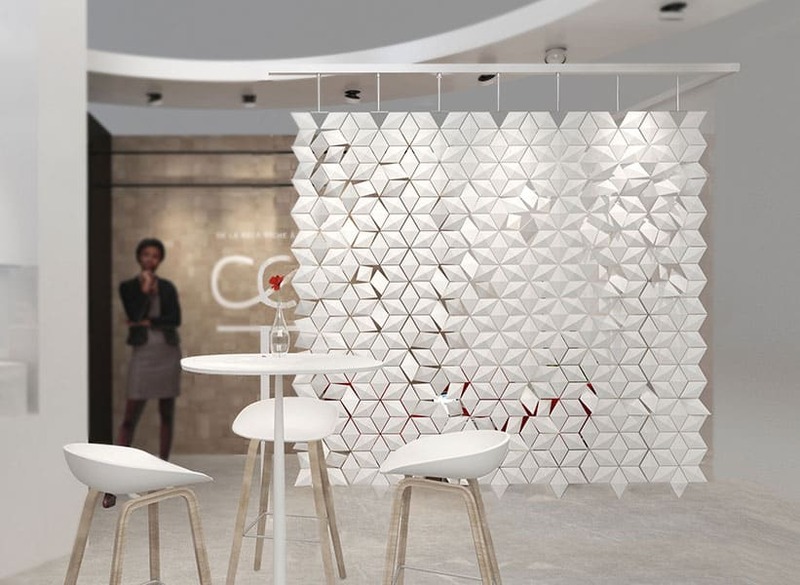 This room divider facet by Blooming features a modular system by Dutch design.